The product is discontinued. For any queries, please contact, support@slscorp.com. 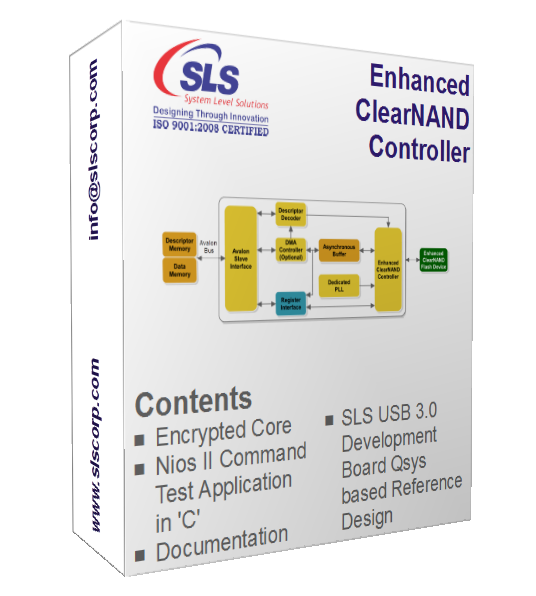 Enhanced ClearNAND Controller IP Core is the intermediate stage between NAND Flash memory and master controller. It is designed to have high speed solution to manage NAND Flash application. It supports Open NAND Flash Interface Working Group (ONFI) standard. Two advanced architectures - register based and descriptor based, provides high speed performance, software flexibility, data integrity and device compatibility. Descriptor based architecture reduces amount of CPU intervention. Enhanced ClearNAND Controller IP Core gives full support for Altera’s SOPC Builder and Qsys based systems and provides communication between processor and NAND Flash device using Avalon interface. SLS has developed a development Board with Enhanced ClearNAND Flash that can be used to verify the functionality of IP Core. Note: Enhanced ClearNAND is a registered trademark of Micron.